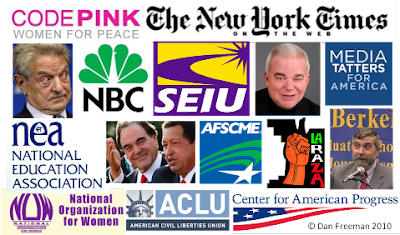 Dan Freeman of Big Government composed a list of enemies - a list that he dubs "the new axis of evil" - that I thought was worth taking a look at. Freeman of course was quick to state that these groups have some good people in them but overall, they are bad, but it Freeman's subsequent rant doesn't really make much sense. He claims these people are largely "economic illiterates" yet he includes billionaires and Fortune 500 companies and he calls organizations like Media Matters a "'think' tank" yet traditionally, think tanks typically conduct "research and engages in advocacy in areas such as social policy, political strategy, economy, science or technology issues, industrial or business policies, or military advice" - Media Matters only reposts comments made by conservatives and makes observations based on those peoples past comments and/or actions. Perhaps the most perverse characteristic of the new axis of evil is its disdain for the individual. Without exception, they seek to usurp power traditionally reserved for individuals in order to empower the state, which, of course, funds their mischief. This, I believe, gets us closer to why this band of misfits is not merely wrong, but evil. The Greek philosopher Plotinus described evil as the negation of the good. When individuals’ are allowed the freedom to make the crucial decisions that affect their own lives, and held responsible for these decisions, they have control over their own destiny, and this is the primary ingredient in living happy, satisfying, and meaningful lives. Since the Renaissance, individuals have gained more and more control over their own lives. Under America’s unique system of individual liberty, limited government, and free enterprise, the individual thrived and humanity leapt ahead in inconceivable ways. Life expectancy doubled in the US from 1850 to 2000, and a typical middle class American had within his control the opportunity (not the guarantee) to live a life that was previously available only to those lucky few born into privilege. This is why we consider America a great nation. Our love of country is not the blind nationalism that academics mock. Rather, it is a love of freedom and self-government. America is the world’s greatest good, not because we are rich and powerful, but because we are free, and through that freedom, have been able to achieve a remarkable degree of control over our own lives. That control has been steadily whittled away by the new axis of evil. If, as Plotinus said, evil is the negation of the good, then fundamentally transforming America—Obama’s paramount goal— from the world’s beacon of freedom to a European socialist state where leaders lord over their subjects whom they consider too feeble and inept to handle the burdens of life, is one of the greatest evils that can be perpetrated. This single paragraph is just full of misinformation and plain lies. Freeman insists this new axis has a "disdain for the individual" but it is his politics that supported the Citizen's United ruling that helped move corporations one step closer to become citizens. He believes America's "unique system of individual liberty" is the reason why life expectancy increased for 150 years - surely it couldn't be the advances in science and medicine that contributed to that increase. Also, what would explain the increase in life expectancy in nations with considerably less individual liberty like China, whose current average life expectancy is trailing the United States just slightly, coming in at 73 years (America is at 78). It also makes you wonder just how exactly he wants to celebrate individual liberty when, again, his politics want to reduce liberty by raising the retirement age to 70, essentially making the individual a slave to corporate interests. How can a middle class American "control the opportunity to live a life that was previously available only to those lucky few born into privilege" when health care costs are skyrocketing? Freeman also claims this new axis has "whittled away" our freedoms, but I am again reminded by Freeman's poltics - wouldn't constitutional amendments defining marriage or laws designed to increase our security at the cost of our liberty (Patriot Act) do more to "whittle away" our freedom then say universal health care? If I were to make a list defining the new axis of evil, I can guarantee Andrew Breitbart's websites would be at the top. What would your list look like? You need to read my comment and the comments I received in response to this article. I own my own business and I have been self-employed for virtually my entire life. However, to the lemmings, I am a communist, corn-holer, but they did not stop there. They even went after my mother and father. Enjoying the going away party. Pretty harsh insults coming from Troll Police. I cannot see how your comments would warrant such a response - you simply stated the comparison to nations like North Korea was a bit far-fetched! At least wldbil supplied links to support his argument although citing Michele Malkin is hardly worth anything.